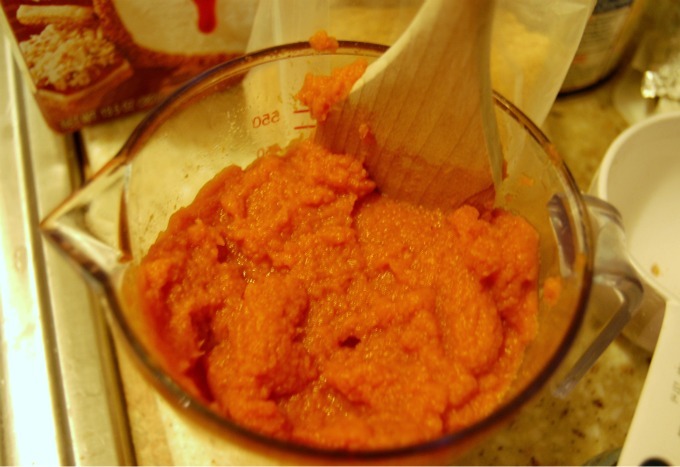 I am sure you all are sick of pumpkin by now, especially after I have already posted a recipe for pumpkin cookies and pumpkin spice cupcakes. But, here's another one! This was by far my favorite pumpkin recipe-pumpkin cheesecake! It was so delicious and it was a huge hit at Thanksgiving. I've already been nominated to make this ever year, I might even make it again for Christmas. 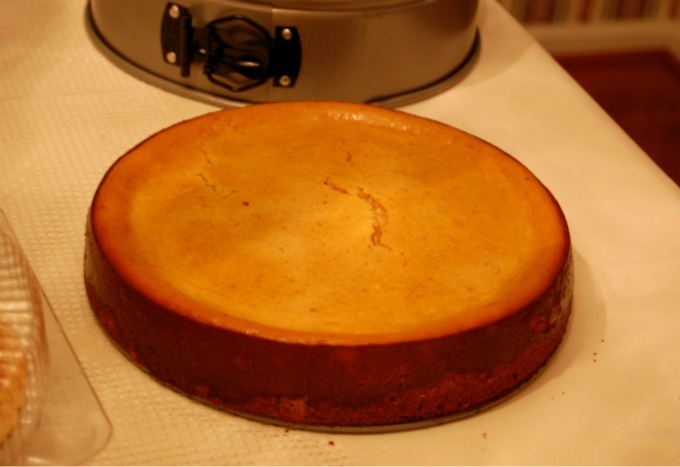 It was a thick, creamy, New York styled cheesecake with the perfect amount of pumpkin. The only thing I would change is to try making this using a "waterbath" to avoid the crack in the middle that comes out after baking it and chilling it. (PS: Um, does anyone really know what a waterbath is when it comes to baking? I kind of have no idea. Haha. I just heard that should be done to avoid cracking.) I used this recipe here! PS: This was my first time to ever make a cheesecake! I was pleasantly surprised by how easy it was to make. WOWWOWOW---it came out amazing! I love the colour of it too! That perfect pastel orange! Looks yummmmmy! Happy holidays babe and have a super rad weekend! DELICIOUS. I only tried pumpkin for the first time the other day after years of telling everyone I hated it. It is really tasty, haha. You must be such a good cook! Please come to Australia and make me a cheesecake. 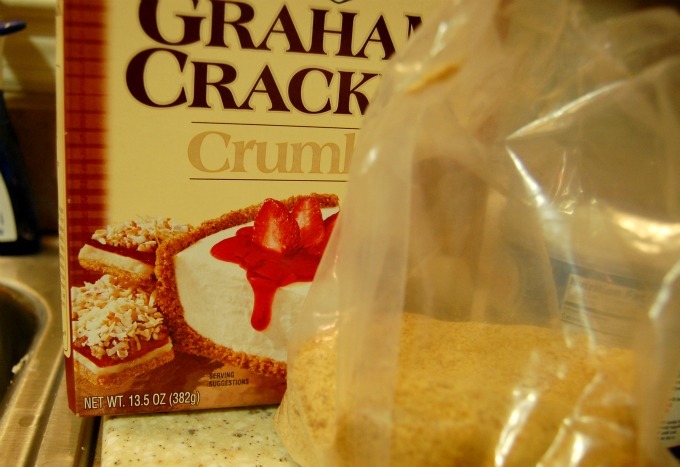 Crack or no crack, that is one tasty looking cheesecake. I also have no idea what a waterbath is... sorry! That looks so good :) All a "water bath" is you take a sheet pan (like you'd use to make a big cake) fill it with water then set the pie dish in it then put it in the oven to bake like normal. The water heats up to help cook the cheese cake evenly so when it goes to cool the sides and everything is around the same temperature so no cracking! Ummm Chelsea, that looks SUPER YUM YUM! HAHAHA It looks really good. Thanks for posting the recipe. Have a wonderful weekend. Thank you Amber! Haha, that would make sense! I had just never heard of that before! Hmmmm...pumpkin cheesecake? That's something new! You're right--everyone has made pies and muffins and such (I made muffins, myself), so this was something nice to see! 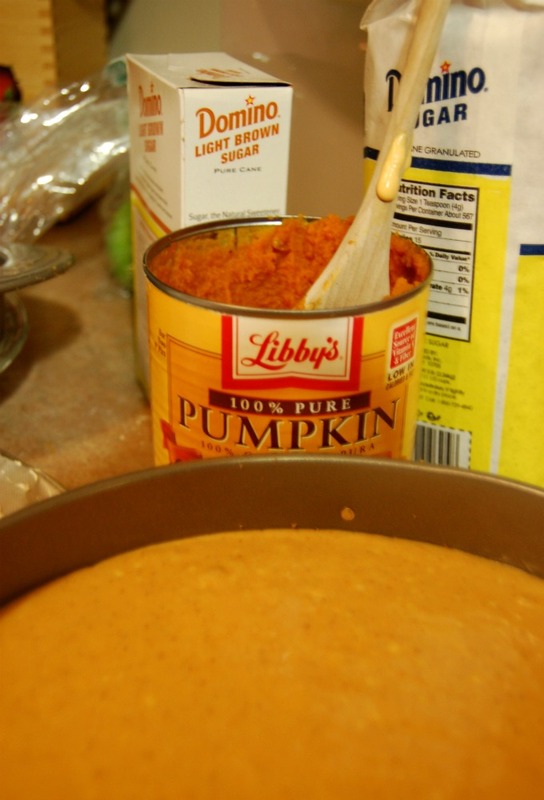 We actually use the same type of canned pumpkin. :) I always add a lot of additional spices, though; it always smells wonderful! Oh, I sure do love pumpkin cheesecake. Pumpkin cheesecake is delicious! It's the only kind of pumpkin pie/cake thing that I like, haha. This looks great! Ohhhh, that looks amazing! Cheesecake is my favorite food :) I've never had pumpkin cheesecake though...I'll have to try that! Ahhh I love cheesecake, and pumpkin cheesecake sounds amazing. I might have to make some soon! i am into cheesecake.. but i have never tried pumpkin .. sounds interesting. Mmm... looks good and looks easy to make as well! Thanks for stopping by! 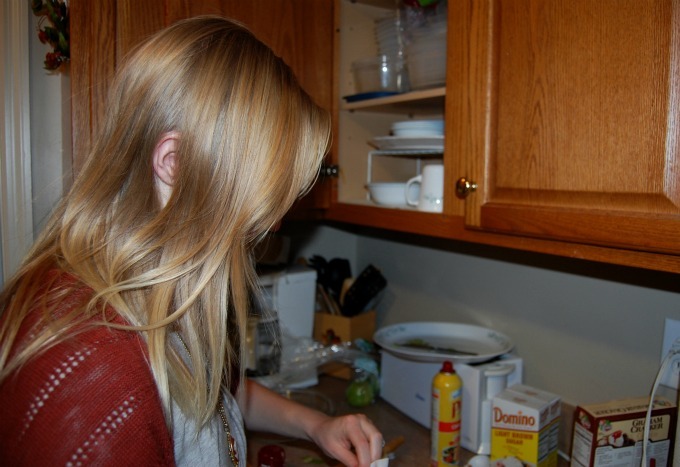 I would have to say that you bake better than me! Looks yummy! following you! Follow me back? Pumpkin Cheesecake? I hadno idea that existed! I love pumpkin pie, so this sounds amazing! I seriously have to try it! This is amazing! I make a pumpkin layered cheesecake but...I use a ready made pie-crust...I've yet to try a springform pan. I can NEVER have too much pumpkin! This looks great! looks delicious! i always make pumpkin cheesecake for thanksgiving! i had pumpkin cheesecake for the first time over thanksgiving and fell in love. this one looks great too! Yum! I'm definatly not tired of pumpkin yet!